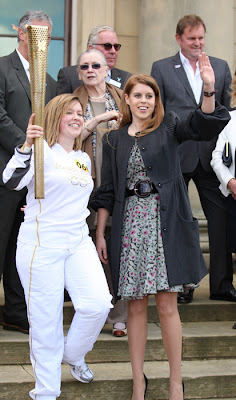 The Olympic Torch got a royal reception today when it was welcomed to Harewood House in Leeds by Princess Beatrice. The princess was the special guest as the torch relay arrived at Harewood House where hundreds of schoolchildren cheered torchbearer Janet Baker up the tree-lined main drive. 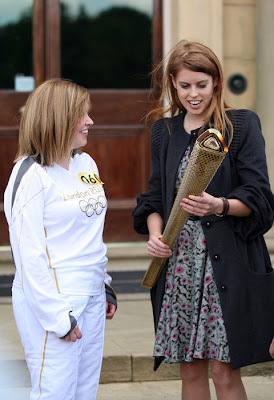 Beatrice met Miss Baker, 33, on the steps of the imposing house along with the Earl of Harewood. Earlier, the princess was greeted with delight by the crowds of families and schoolchildren when she went on an impromptu walkabout in the grounds. Miss Baker, from Leeds, is a charity fundraiser who has raised almost £19,000 for Women-V-Cancer, Alzheimer’s Society, Liverpool Alder Hey Hospital and Manchester Children’s Hospital with her runs. She is waiting to hear if she has been selected to be a first aider for the 2012 Olympic Games. 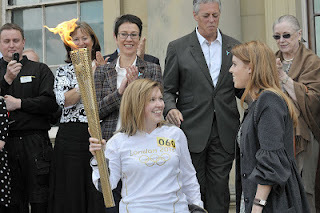 Earlier today, the torch started day 32 of its tour around Britain and Ireland in Hull. 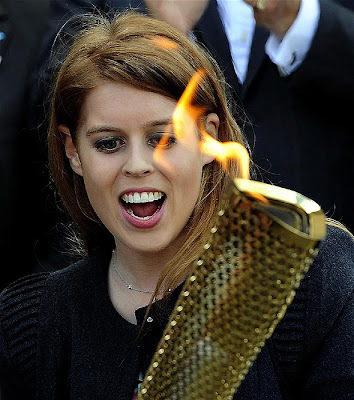 Last night more than 20,000 turned out for torch event in the city’s West Park. This morning the flame was taken into The Deep aquarium where it was greeted by divers playing underwater drums. Again huge crowds were reported as it made its way across East Yorkshire, into North Yorkshire and across to Harewood. York is today’s final destination.